Emeril Lagasse is a household American name. He has put his name and experience behind a handful of air fryers, including the 3.75-Quart Smart Fryer Pro which we are reviewing today. The Emeril brand is a trademarked brand of Martha Stewart Living Omnimedia, and imported/distributed by Kalorik. Some retailers such as Walmart refer to this model as the “Rapid Air Fryer”, as it has Rapid Hot-Air Technology. This is a little confusing as it’s also referred to as the Smart Fryer Pro. They are the same model. If you get confused, just check the model number to see if you’re looking at the right model for this review. The model number for the Smart Fryer Pro/Rapid Air Fryer is FT 43724. Is this a quality, long-lasting air fryer? What’s the issue with the peeling trivet? What kind of controls are used and are they accurate? What accessories do you get? What can you cook with this air fryer? All these questions will be covered below. 1 What Interesting About the Emeril Smart Fryer Pro? 3 What are the technical specifications? 4 How do you use it? 5 How do you clean it? Is it easy to clean? 6 How Does It Compare to other models? 7 Where can I find a replacement basket? 8 Are there other replacement parts or accessories? Where do I buy them? 10 Does it come with a recipe book or cookbook? 11 Can I find it at Home Depot, Walmart, bed bath and beyond, Target or Costco? 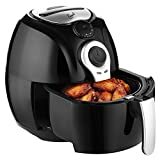 12 What’s the best price For the Emeril Air Fryer and where can I buy it? 13 Verdict: is this air fryer for you? What Interesting About the Emeril Smart Fryer Pro? A simple yet always interesting aspect of air fryers is the controls which have been chosen. Some have flashy digital screens and buttons, while others have humble manual dials. The Emeril Smart Fryer Pro has the humble manual dials. There are no preset functions or extra features to adjust, only a simple timer and temperature dial. A controversial aspect of this air fryer is the trivet which sits at the bottom of the fry basket. It’s not that common for an air fryer to include a trivet, they usually just have a rack insert. The trivet, in theory is a good idea, it suspends the food above the base of the basket. However, this little accessory has become a source of major bother for many customers. More on that to come. The Emeril Smart Fryer Pro comes with a barrel pan and a pie pan. The barrel pan is a high-sided, non-stick pan which sits inside the basket. You can use this for meats and veggies…or anything really. The pie pan is a shallow-sided, non-stick pan ideal for baked goods such as pies and cakes. They are both dishwasher safe, which is always a nice bonus. The reviews for the Emeril Smart Fryer Pro are not as numerous as other popular models. However, QVC does have a good bunch of reviews for this model. Out of approximately 310 reviews, the overall rating is 3.5. Some people, (around 140 of the 310) love it. Others really hated it. And there’s a very, very common reason why. But that’s for the “negative” section. Let’s see what people loved about it before we get to the depressing stuff. Easy to use: many happy customers have expressed how easy this air fryer is to use. People who prefer the old-school charm of manual dials find it to be an easy machine to set and control. Cooks food fast: a good handful of people have expressed their delight at how their cooking time has been slashed by this machine. They find that they can prepare and cook a meal a lot faster than they would with more conventional methods. To give you an idea of the general cooking times, the manual suggests that thin frozen fries take between 9 and 16 minutes, and chicken drumsticks take between 18 and 22 minutes. Very versatile: the happiest customers have raved about how many different dishes they have made with this air fryer. Cakes, wings, fries and hot dogs are all mentioned among the positive reviews. Coating on the trivet peels off: this, by far, is the most common comment in the negative review sections. That trivet seems to be the bane of many people’s existence as it chips, peels and leaves little scraps of non-stick coating in people’s food. Some people have had great luck with contacting the manufacturer for a new one, but I think those trivets will eventually peel too. Small capacity: some people have found that the fry basket is smaller than they had expected. It fits a maximum of 2.5-pounds of food, which for some, is not enough for their needs. Some have found that they have to do multiple batches to get a decent meal on the table for guests or family. Tricky temperature dial: a few comments have stated that they find the temperature dial hard to decipher, with oddly-spaced, oddly-labeled temperature divisions. Others haven’t had an issue at all, so I think it’s one of those things the user just needs to get used to. I do see what they mean though, the “marks” between the numeric temperatures are not set out in equal divisions. You have to do a bit of math in your head to figure out what temperature each “mark” symbolises. Spills oil and grease: on the sides of the fry basket, there are open vents. When you cook certain foods, oil, grease and hot liquid can gather at the bottom of the basket. Because of these vents, quite a few people have found that the hot grease has spilled out and onto their clothing, on the floor or all over the bench. They find that they have to be overly-careful and steady when removing the basket from the unit to avoid spilling hot oil. They are not happy about this at all, and fair enough. Special features Barrel pan and pie pan: the barrel pan and pie pan are for cooking different kinds of foods (i.e. meats in the barrel pan and baked goods in the pie pan). They are non-stick and dishwasher safe. Timer: the timer dial is clearly marked from 0 to 30 minutes. When the timer is set to “0”, the unit turns off and the cooking process is halted. Temperature dial: the temperature dial is set out from 175 to 400 degrees Fahrenheit. Some find this to be a hard-to-decipher dial (see above). Trivet: oh, the trivet. It is designed for the food to sit on top if inside the basket, to ensure air circulation. As we know by now…it peels. Non-stick/dishwasher friendly parts: the trivet, basket and pans are safe for the dishwasher. That’s about it. It’s pretty simple, but you do need to watch out for the leaking liquid. This is a tricky question. Some have said that it’s very easy to clean, while others have expressed frustration regarding the trivet. They have found the trivet hard to clean, and fiddly when trying to remove it from the basket once the cooking process is over. From my understanding, the trivet will be covered in any oils or liquids released from the food during cooking when the food is placed directly onto the trivet. Because the trivet has lots of little vents, surely it’s a bit of a nuisance to clean oil and grease from it if you don’t have a dishwasher to do the job. The barrel pan, pie pan, trivet and food basket are all safe for the dishwasher. Otherwise, they must be hand-washed in hot, soapy water with a soft brush or sponge. Avoid using anything harsh or abrasive as it might damage the non-stick coating (pretty standard for most accessories of this nature). The unit itself just needs a wipe down with a damp cloth. That goes for the interior and exterior. The Philips XL is a well-loved, highly-rated air fryer with some pretty great features. Unlike the Emeril Air Fryer, it has a digital display as opposed to manual dials. It has a far higher wattage than the Emeril, at a great 2100 Watts (Emeril has 1500). The Philips has a very slightly higher capacity at 2.65 pounds of food, compared to Emeril’s 2.5 pounds. The Philips’s timer can go up to 60 minutes, double the duration of the Emeril timer. Interestingly, the Phillips XL has Philips’ special Rapid Air Technology which delivers fast and furious air circulation for quick cooking. The Emeril Air Fryer has Rapid Hot-Air Technology, (which seems to be the same name given to the technology used in the Chefman RJ38 Air Fryer). The Philips XL is much more expensive, around the $299 mark if you can get it on special, otherwise you’re looking at around $399. Okay, honestly? The Philips XL is better. It has a better track-record with happy customers, more sophisticated, accurate controls, more wattage and a longer timer. If you can spare the extra cash, I would opt for something more like the Philips XL, as you’re going to have less issues and stress in the long run as you won’t deal with peeling trivets or leaking baskets. Where can I find a replacement basket? If you lose, break or find that your basket is faulty, call the manufacturer. Many people have found that the customer service department is helpful with the “peeling trivet” issue, so they might be as accommodating with the basket too. It’s proving hard to find separate baskets for replacement. Are there other replacement parts or accessories? Where do I buy them? As of now, it appears to be very hard to find separate accessories for this model. Again, I recommend contacting the manufacturer first, as they might be able to send you what you need, or point you in the right direction. Does it come with a recipe book or cookbook? You get 30 recipe cards in the box. Can I find it at Home Depot, Walmart, bed bath and beyond, Target or Costco? What’s the best price For the Emeril Air Fryer and where can I buy it? Currently, the best price for the Emeril 3.75-Quart Smart Fryer Pro is $99.99 at Walmart, with Amazon at a very close second place. It pays to keep checking various stockists before you pay, as prices can switch and change all the time. Verdict: is this air fryer for you? I just can’t recommend that you spend your money on an air fryer with such a high risk of peeling, faulty accessories. I also don’t like the idea of a leaking basket. It’s a shame because the cooking ability and ease-of-use seem really great. But that’s just the way with appliances, you’ve got the choose the best one for your buck. I recommend the Cozyna Air Fryer as an alternative to the Emeril Smart Fryer Pro. It follows a similar philosophy as the Emeril: manual temperature and time control dials (up 400 degrees F and up to 30 minutes) and a draw-style basket. However, it has a higher capacity (5.8-Quarts), and a 1700-Watt power rating. It’s a higher-quality air fryer which is more worthy of your time and money. At the moment, it costs around $110, which is only scarcely more expensive than the Emeril Air Fryer.